Global warming is leading to more violent winter weather. In Britain we are now used to trees being uprooted, garden sheds blowing over and coastal waters whipping up into a frenzy. 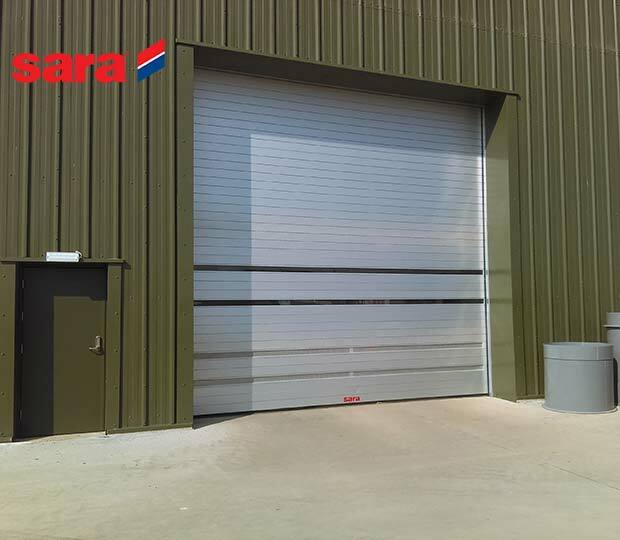 Louise Nurse, Sales & Marketing Manager of sara LBS warns that owners and operators of warehouses and factories should make sure their industrial doors are designed to withstand anything nature is likely to throw at them. Industrial doors have large (often very large) surface areas so can be subject to considerable wind loads. It is therefore a good idea to check them over within the next few weeks and make sure they are not likely to let you down in winter. But how do you do that? There are three things that can be done fairly easily. Firstly, you can do a physical check: see if the doors look robust and make sure they open and close freely; check around the edges to see if they seal into their frame or if there any gaps that could let wind through; look for signs of damage (wind induced or otherwise) and weakness. Secondly, talk to the loading bay personnel; don’t ask leading questions but try to ascertain how the door performs in winter – does it keep the weather at bay, let wind and rain through, rattle in its frame, function as normal? Finally check the owners’ manual or contact the manufacturer to confirm its certification against the standards of EuroNorm DIN EN12424. Any responsible manufacturer should be able to tell you what class their doors meet. They will probably include the information in the user manual and may even have it as boilerplate information on the door itself. • Aluminium profile doors are typically Class 3 – EN12424 This makes sara PVC Curtain doors suitable for indoor use and for outdoor installations where they are protected overnight and during bad weather by an external heavy duty door. Sara aluminium profile doors are suitable for all but the most extreme climatic conditions and ideal for use almost anywhere in the UK. Of course it should be said that older doors that have given long and sterling service may be beginning to show their age. Regular maintenance and prompt attention to any damage will keep the wind and weather tight and lengthen their working life. Now let us consider the effects a wind damaged door could have. Probably the worst thing is that a badly damaged door could render the loading bay total unusable until the door is fixed. (If the facility has only one loading bay, this is going to be a major problem.) The next issue is that the loading bay and surrounding area will be unprotected and exposed to the full extent of the winter weather and Health & Safety won’t like that. Security from thieves will be compromised to the extent that a night watchman may have to be employed until a repair is completed. Similarly bio-security will fail and it is only natural that birds and small animals (up to the size of a fox or badger) are likely to come into the loading bay seeking shelter from the winter night. We’ve enjoyed the best summer on record, but ‘Winter is coming’. It’s best advised to assume it us going to be a cold one, so check your loading bays are prepared for the winter ahead.